Basic Thai ingredients you need to make Thai food. Basic Thai ingredients are very similar to Malaysian and Indonesian ingredients minus the Thai fish sauce and Thai basil. It is the way of preparation and the combination of these ingredients that set Thai food apart from the other foods in the region. Thailand is a big country, the kind of foods in each region varies greatly but the basic Thai ingredients are pretty similar everywhere. The southern part mostly uses a lot of seafood because The Gulf of Siam and South China Sea on the east side and the Andaman Sea on the west side of the country enable the people to harvest the fresh seafood. The northern part which borders with Myanmar and Laos hardly enjoy any seafood and the climate is also temperate. Therefore, we can expect different kind of ingredients used in the northern territory. Even then, basic Thai ingredients remain about the same. Lime, kaffir lime and kaffir lime leaves - the fresh citrusy flavor of green lime, kaffir lime and it leaves give soups and salads a punch. Bird's eye chilies ("cili padi" or "cili burung" in Malay) - these small red or green chilies are extremely fiery and usually added to soups,	curries and spicy salads. 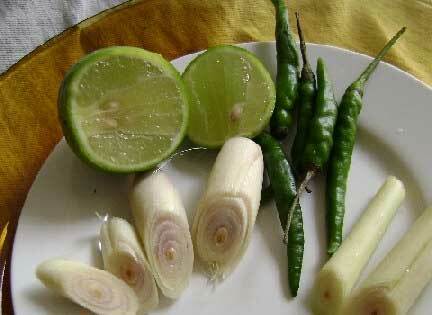 Lemongrass (note the purple rings), lime and bird's eye chilies. Thai basil - with a strong aniseed scent and liquorice flavor, Thai basil leaves sweeten and perfume curries, soups and stir-fries. Fish sauce - A vital seasoning in savory dishes and dips, this has a pungent fishy aroma and a salty taste. Coconut cream - thick and opaque, this first extraction of grated flesh of mature coconuts adds a rich creamy texture to foods. Dried shrimps - these salty pink dried shrimps are used to flavor vegetable stir-fries, seafood and soups. Tamarind - adds a welcome tartness to soups, sauces and chutneys. The pulp is mixed with water, kneaded and strained before use to get the juice. Curry pastes - Thai curries both use green and red curry pastes made of galangal, lemon grass, ginger, coriander, garlic, shallots and chilies. There is also yellow curry, which is of medium hotness as compared to red curry. Green curry is the mildest which normally uses a lot of cream coconut. Palm sugar - Called "gula melaka" in Malay, it is used in Thai desserts and dressings for its rich flavor and fragrant sweetness. Lemon grass - Use only the lower part of the stalks, as a rule, when you cut it in thin rings, use only the part where you can see the purple rings. Discard the rest of the stalk and the leaves. Take Rapid Bus no. 101 from KOMTAR.